The latest weekly United States Mint numismatic product sales report includes the debut figures for the White Mountain National Forest Quarter bags and rolls. The second reported figures for the recently released 2013 Proof Silver Eagle are also available. 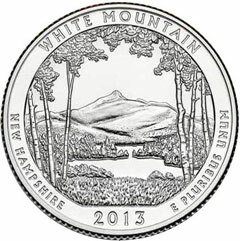 Sales of White Mountain Quarters in numismatic bags and rolls began on January 28, 2013. There were a total of seven different ordering options available, which included circulating quality coins with the “P”, “D”, or “S” mint marks. The coins bearing the “S” mint mark are struck at the San Francisco Mint and not released for circulation. Through the reporting date of February 4, sales have reached 2,141 for the 100-coin (P) bags, 2,096 for the 100-coin (D) bags, 24,429 for the Two Roll (P&D) Sets, 3,385 for the Three Roll (P,D&S) Sets, 2,761 for the 100-coin (S) bags, and 3,909 for the 40-coin (S) rolls. Surprisingly, the two roll sets have seen a big boost from the previous release where the option had debuted at 14,735. The bags and rolls of “S” mint marked coins saw a decline, as some of the demand likely shifted to the newly introduced Three Roll Set option. For its second appearance on the weekly reports, the 2013 Proof Silver Eagle added sales of 21,592, bringing the cumulative total to 280,452 units. This trails the pace of sales from the prior two years. The White Mountain ATB 2-roll set total sales seem questionable. At 24,429 sold, that surpasses the entire 2-roll sets sold to date for the El Yunque (24.260). And that doesn’t include the additional 3,385 3-roll sets. Also, the S Mint rolls seem very low compared to the P/D Mint rolls, especially with the increased interest in the sold out S-Mint rolls and bags of the previous quarters. Are the P and D Mint White Mountain coins really that much more popular than the S Mint coins? In line with the previous bags/rolls of the P/D/S quarters, it would be more realistic that the numbers are transposed.for the 2-roll and 3-roll sets. That is, the 2-roll sets should be 3,385 and the 3-roll sets should be 24,429. If my math is correct, the US Mint sold a total of 567860 S White Mountain quarters so far. That’s about a third of last year’s average mintage. I guess they minted a lot more S quarters this year. Looks like the Denali 5 oz is about to sell out. Hence the run on them in this report. First Spouse Gold ? William Jefferson Clinton ? just a thought.